I would be willing to bet that if you opened up every beat-up tool chest in every garage and workshop around the world you could find at least one Stanley© PowerLock tape measure. . . This iconic tool turns fifty years old this year and you can bet that everyone wanted a piece of this successful product… heck, we even have one that we give away at trade shows! 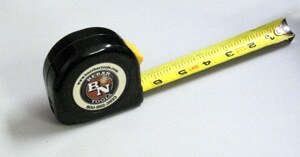 For more history information on the Stanley© PowerLock tape measure CLICK HERE. . . it actually went to the moon??? How cool is that.